I guess I just thought it was about time for me to publish my own scream. This is a strawberry and vanilla malted milkshake type mix. The strawberry combo (Daveberry Trinity) is the best I have found for a good sweet syrupy type artificial strawberry. I used the fw hazelnut both for the maltiness and it just makes strawberries just a bit riper. The vanilla cupcake is there for sweetness and to thicken up the mix. I think you bet Cheeba out of my favorite sb and cream. Mixed a 60 ml and it barely lasted a day and a half. Most strawberries after 15-30 mls i go blind to them and can’t taste them, but I managed to vape 60 mls and tasted every drop and my cotton was still white when I replaced it which to me is always a plus. Excellent job and thanks for sharing. Just refilled the 60ml bottle now i just have to wait for it to steep. I don’t know why I haven’t mixed this sooner, but am so glad I finally did. As a S&V it’s more hazelnut forward and I imagine this will change with steeping. The Daveberry trinity is great, however the shisha vanilla, hazelnut and vanilla cupcake take this one over the top. So simple and so fu*king delicious. Great job Emily! Sooooooo damn GOOD! There are so many S&C recipes out there, I sometimes feel like Pac Man trying to gobble them all up, but this one really stands out. That "Daveberry Trinity" is a magic combination, so bright and lively and STRAWBERRY-in-all-caps, and it just stands up beautifully against that nice, thicc milkshake base. I mixed up 60mls right out of the gate, because it sounded so good, and guess what; time for another 60mls! I love this recipe! Thanks so much for sharing it. amazing s@c im so picky about strawberry vapes and usually switch so many things around with recipes i try its nothing like the original but this one is perfect for me no need to change anything. This is the best strawberry and cream recipe I have tried to date. It was my introduction to the Daveberry trinity combination of FA Red Touch, INW Shisha Strawberry, and JF Sweet Strawberry. The way that it's used in this with hazelnut and creamy milky undertones replicates the delicious flavor of an actual malted strawberry milkshake. 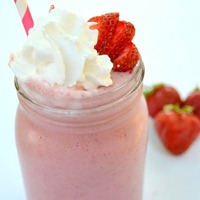 Seriously, if you enjoy strawberry milkshakes, this is the one to beat. Vanilla cupcake brings an amazing sweet quality, so you do not need to bring sweetener. I will definitely be mixing this one up for a very long time.